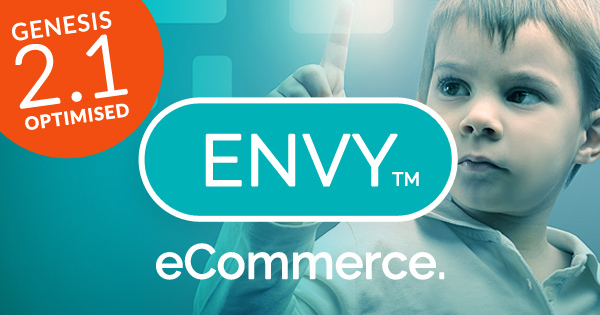 Envy eCommerce WordPress Theme - Genesis 2.1 Optimised! Envy WordPress Theme for Genesis 2.1! My previous post officially announced the exciting release of ENVY – a new WordPress theme and WooCommerce-enabled e-commerce solution developed for StudioPress’s heralded Genesis framework … StudioPress‘s heralded Genesis framework Version 2.0.2! And then, as if Murphy had laser-traced his eye on my blog, just 2 weeks later, StudioPress proudly announces the release of its updated framework, Genesis 2.1. Aaargh! So, after a few hours of kicking the couch and yelling into pillows, it was back to the drawing board for the ENVY theme. And a week later (although it seemed like a month), ENVY v1.1 was released – specifically optimised for the new and improved Genesis 2.1 framework. So, what’s new in Envy v1.1? How different is it? Well, visually, there is little difference on the front-end. Most notable is the new max-width of 1200px for wider screens as opposed to the 1140px width of its predecessor. And as such, some minor adjustments have been made to the sizes of default images and thumbnails. However, the new child theme stylesheet has been constructed entirely from the Genesis 2.1 stylesheet. No corners have been cut lifting large chunks of previous CSS code into the new CSS file. In other words, every line has been assessed individually and either removed or modified. Some theme settings have now been migrated to the Customiser. Primary Navigation Settings have been removed. Max-width has been increased to 1200px for wider screens. Media query ranges have been adjusted. Other measures taken to further improve stability and security. A full list of adjustments to Genesis can be viewed in the Genesis Framework 2.1 Changelog by Gary Jones. Further information on updates to ENVY (and how it affects existing ENVY users) can be viewed on the ENVY blog Envy Now Optimised for Genesis 2.1!